Christmas decorating and gift giving is in full swing! Don’t you love when you can combine the two? Recently, I needed a neighbor gift and came up with this fun candy cane wreath! I wanted the candy to be edible as well so made sure to use an adhesive that would hold the candy canes but also allow them to be removed with too much hassle. Started by pairing the candy canes together and tying them with the curling ribbon. 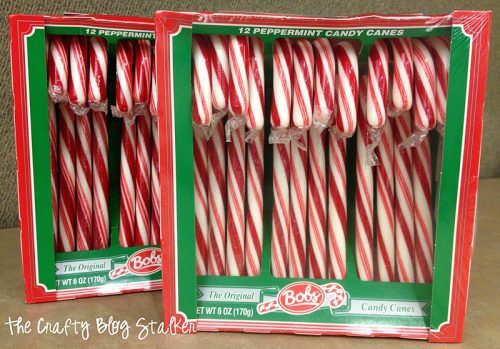 I used a total of 20 candy canes and made 10 bundles of two. The centerpiece of the wreath is what holds all of the candy canes in place. 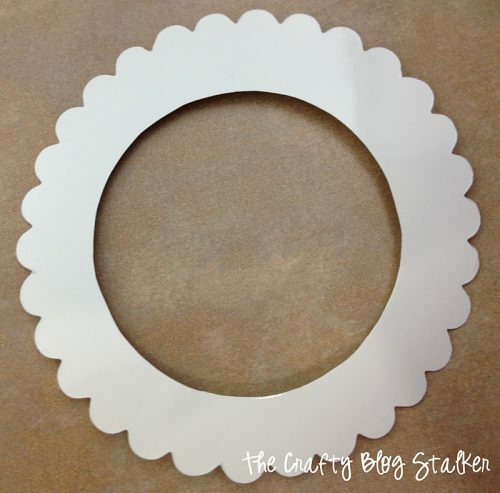 The base of the centerpiece is a large white scallop circle from white cardstock. I had originally wanted to be able to see the ends of the candy cane through the center so I cut a hole in the center of the scallop circle. This didn’t work how I had wanted so you don’t need to cut out the center. 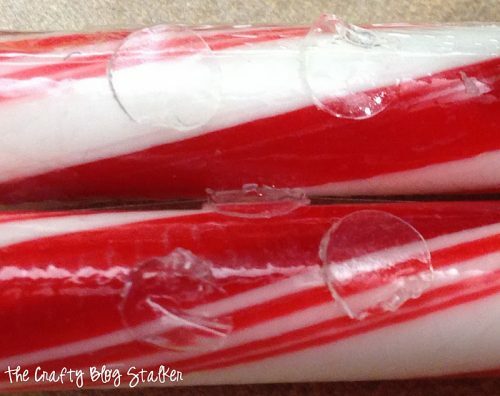 Use several glue dots to the end of each candy cane to secure to the Scallop Circle. Turn the wreath over and place a second scallop circle on the other side of the wreath. This will help stabilize and distribute the weight of the candy canes a bit better. 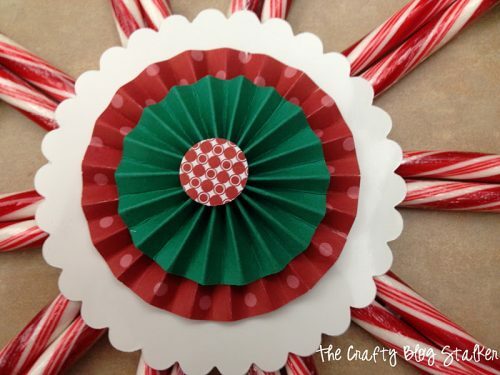 To create the lollie for the centerpiece, cut strips of different yet coordinating papers. For the bottom lollie, cut 2 strips of paper that measures 5.5 x 2.5-inches and score every 1/4-inch. 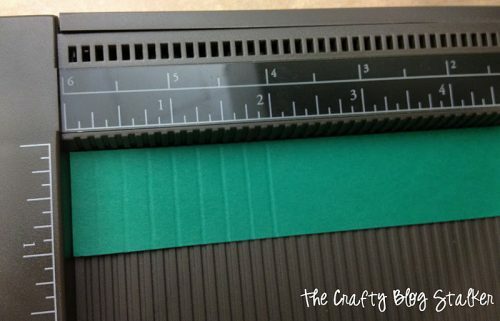 For the second layer lollie, cut 1 strip of paper that measures 7 x 1.5-inches and score every 1/4-inch. Fold the strips of paper accordion style and connect the ends with glue. The next step requires both hands so I couldn’t take a picture while I was doing it. 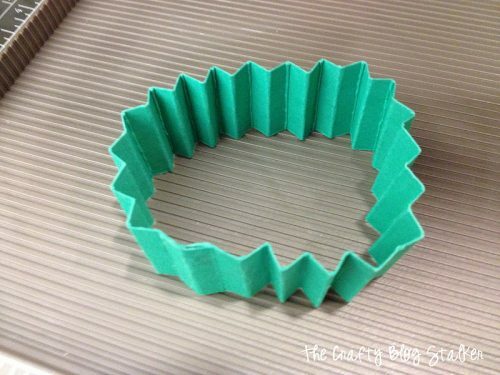 flatten your strip of accordion folded paper, and hold together with a glob of hot glue. Then layer the lollies together. Top off with a smaller circle to hide the center of the lollies. Isn’t the finished candy cane wreath cute?! I am super excited to give the wreath to my friend! Who would you give a candy cane wreath too? Or would you keep it for yourself? Share and leave a comment below! 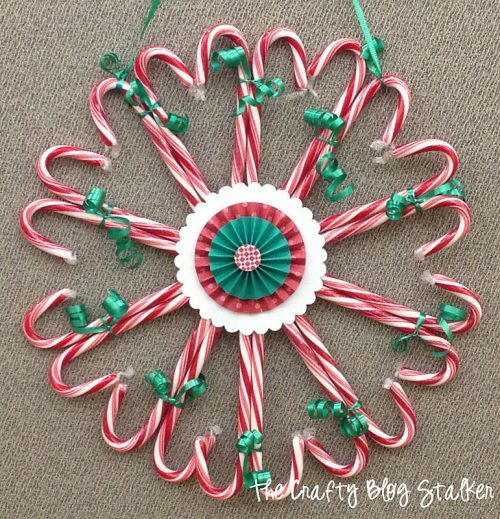 SAVE HOW TO MAKE A CANDY CANE WREATH TO YOUR FAVORITE DIY PINTEREST BOARD! 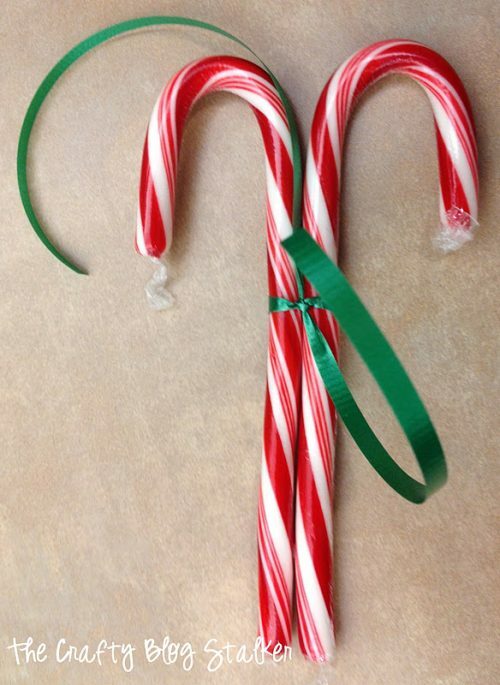 Nice way to reuse old candy canes, too! Thanks for linking to Things I’ve Done Thursday! I love your wreath! Very unique. Super fun!! I love it – I may have to give it a try. It looks like it would be easy and fast. What a creative idea. I love it. Now I’ve got to check out all the other great projects you’ve done. I’m so happy I came across your blog. Wow such a cute idea. Thanks for sharing. Cute, and I love that you kept yours edible! 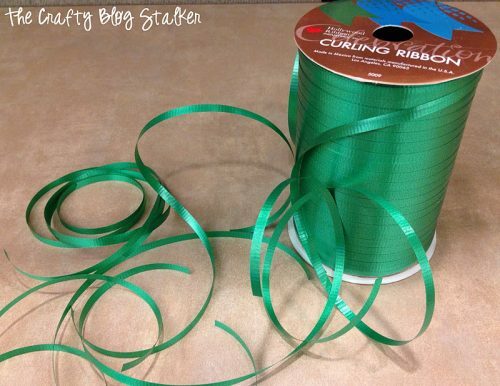 I hope you will link this post to my Christmas Traditions Link Up in the Crafts category. It starts tomorrow! I love this! PInned it for next year. Thanks. I love your candy cane wreath! So festive for the Christmas season 🙂 Thanks for sharing-I might have to make one. Enjoy your day. This is such a cute wreath! Love it! So cute! Pinning it to make next year!! Found you via Feature Friday link up! I host a Pinterest Tuesday Link up over at my blog. I’d like to invite you to link up this post or any other Pinterest idea you have. Hope to see you on Tuesday. Loved this so much, I featured it on Mom’s Library this week! Hop over and grab an I’ve Been Featured on Hey Mommy, Chocolate Milk button to proudly display on your post! Can’t wait to see what you will link up this week! I just sprinkled this post at all my favorite places: Facebook, Twitter and Pinterest. Thank you for sharing at Freedom Fridays and thank you for being one of my five faves!! !